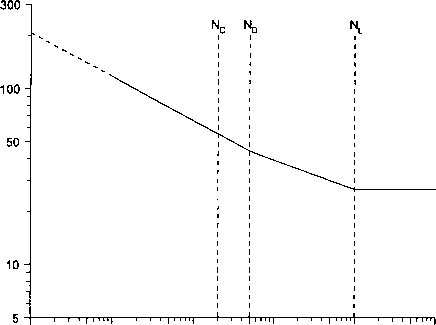 (1)P The generalised form of the Aa-N relationship is shown in figure 1.5.2, plotted on logarithmic scales. 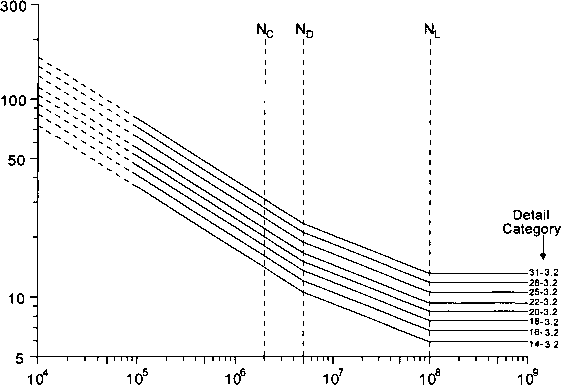 The design curve represents a mean minus 2 standard deviation level below the mean line through experimental data. yFf is the partial safety factor allowing for uncertainties in loading spectrum and analysis of response (see 3.4); YMf is the partial safety factor for uncertainties in materials and execution (see 5.2.1(3)). (3) For normal applications where the design conforms with this Prestandard, including the manufacturing requirements of Annex D, a value of yMf= 1,0 may applied (but see 5.2.3(3) in the case of adhesively bonded joints). 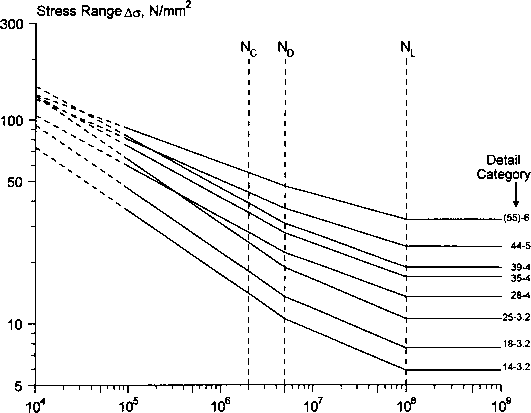 (4) The constant amplitude fatigue limit, AaD, occurs at 5x106 cycles, below which constant amplitude stress cycles are assumed to be non-damaging. However, even if occasional cycles occur above this level, they will cause propagation which, as the crack extends, will cause lower amplitude cycles to become damaging. 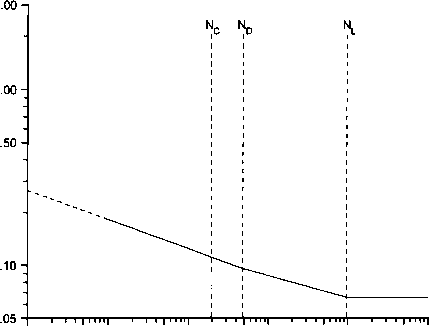 For this reason the inverse logarithmic slope m2 of the basic Aa-N curves between 5 x 106 and 108 cycles should be changed to m2 for general spectrum loading conditions, where m2 = mi + 2. 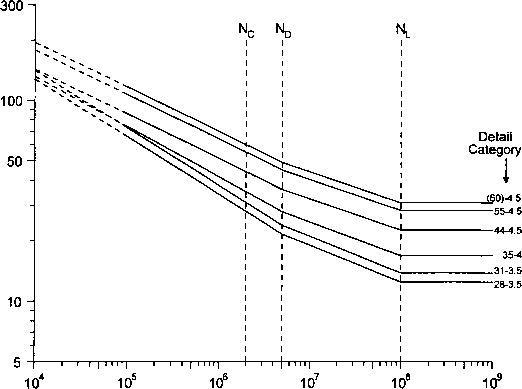 (5)Any stress cycles below the cut-off limit AaL, which occurs at 108 cycles, should be assumed to be non-damaging. (6) The Aa-N relationship is folly described by the double number detail categoiy Aac - mi where Aac is an integer expressed in units of N/mm2. Their values are given in tables 5.1.1 to 5.1.5. The Aa-N curves are given in figures 5.2.1 to 5.2.5. (7) For the purpose of defining a finite range of categories and to enable a category to be increased or decreased by a constant geometric interval, a standard range of Aac values is given in table 5.2.6. An increase (or decrease) of 1 category means selecting the next larger (or smaller) Aac value whilst leaving mi and m2 unchanged. 8)P The detail categories are safe for all values of mean stress (see 5.3) but do not allow for environments other than ambient (see 5.4). 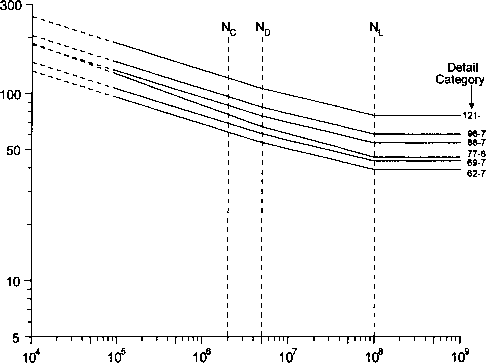 9) The use of the m2 = mi + 2 inverse slope constant may be conservative for some spectra. Where a design is critically dependent on this region and where maximum economy is sought it may be appropriate to consider using component testing (see Annex C.3.1) or applying fracture mechanics analysis (see Annex B). (10)P The detail category values in tables 5.1.2(b) and 5.1.3 shown in brackets are attainable only with high weld quality levels which are not readily verifiable by normal non-destructive testing techniques. In order to meet the needs of quality assurance, bracketed values should only be used where special inspection procedures are applied which have been demonstrated to be capable of detecting and evaluating critical sizes of weld discontinuity which shall have been established by fracture mechanics or testing (see Annex B and C). - Peel loading should be reduced to a minimum. - Stress concentrations should be minimised. - Strains in the parent metal should be kept below yield. - Chemical conversion or anodizing of the surfaces generally improves fatigue life compared to degreasing or mechanical abrasion. - Aggressive environments usually reduce fatigue life. (3)Testing under representative conditions of geometry, workmanship and environment is recommended for critical applications. Otherwise a high value of yMf should be used. Casting as per Table 1.1.2. Machining permitted if by high speed milling cutter. Weld discontinuities permitted by Annex D Table D. 1. Values of A ac for hot spot stress assessment of weld toes are given in table 5.2.7.